A blog dedicated to fashion history, dynamic women and observations of selling in cyberspace. Some time ago, I found a blue striped nursing uniform from 1921 belonging to a Miss Maude Schurr of Philadelphia. When my hubby noticed the stripes he made a racy comment about candystripers (one I can't mention here!). I shushed him of course but it turned out he was on the right. track The gradual change to sterile white by the 1940s saw the stripes passed on to the hospital aids. The first actual nurse uniform was introduced circa 1860 and was indeed a far cry from the scrubs of today. 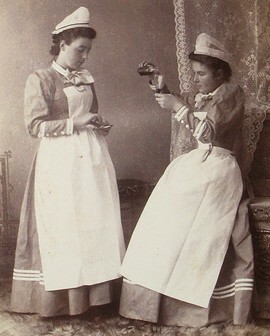 Before the 19th century nursing was not a respected profession and most nurses were unmarried women who volunteered in the poorest communities for cities and health facilities. 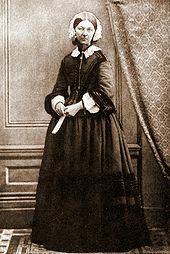 Florence Nightingale (1820-1910) changed everything. "The Lady with the Lamp" first gained fame during the Crimean War for tending to wounded soldiers at night. Gifted in math, she was also a statistician who used pie charts and created the polar area diagram (still used today - see photo) to illustrate seasonal mortality rates at a military field hospital she managed. (Parliament would otherwise never have understood traditional statistics to grasp the severerity of the war.) 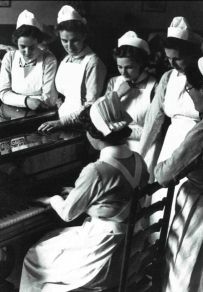 In 1860, she pioneered modern nursing and opened it's first school, St. Thomas's Hospital in London. She tirelessly advocated for sanitation and hospital hygiene and her efforts greatly reduced death rates especially in the military. Of all her books, "Notes on Nursing" is the most renowned but she also wrote the never fully published "Suggestions for Thought to Searchers After Religious Truth". One of the sections in the three-volume book is called Cassandra and protests women's inability to lead more productive lives. From all that I have read about this dynamic woman, I'm not sure she believed that women were held back by men but rather that they held themselves back preferring a comfortable life with minimal social awareness. She was in fact born into a wealthy family and in 1844 her mother, who wanted her to marry, protested her career choice. It was quite a courageous act for a young Victorian woman who could have opted for a life of ease. Ironically, due to her efforts nursing eventually became one of the few decent professions a woman could enter into and was encouraged by mothers everywhere. After all, not only was it good training for marriage, it provided ample opportunities to meet potential husbands! This idea certainly didn't fizz into the 20th century as you can see from the 1930s recruiting ad pictured above. 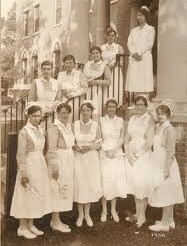 Some believe nursing uniforms were adapted from habits since prior to this time nuns primarily cared for the sick. Though nurses wore similar dress, it was actually one of Florence Nightingale's students, Miss Van Renssealaer, who designed the first recognizable uniform which was mainly blue with a starched white apron and frilly cap. The uniforms were considered "fever proof" as they covered the entire body except the face and hands. Only the hats varied among hospitals and were often used to denote rank. Cloth hats were largely replaced with paper disposables by the 1950s but by the end of the 1970s they were gone altogether. The World Wars brought the greatest changes as functionality became a priority. Due to high casualties, the starched aprons, long skirts and sleeves were eventually abandoned in favor of increased efficiency and mobility. Mass production led to shorter and simpler styles with easy cleaning. 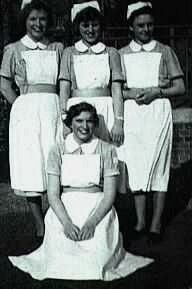 Busy hospitals during the 1950s demanded wash and wear and even halted the starching. 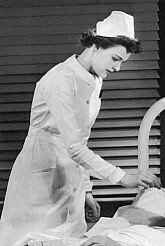 As early as the 1960s, scrubs were brought over from Europe and though only worn in select US hospitals, these marked the beginning of the end for traditional nursing attire. Also during this time, more men entered the profession and by the 1980s they were far more prominent in the field. Today, scrubs are the norm being comfortable, stain and bacteria resistant as well as unisex. You know, it's been like this for a couple decades now and yet when I visualize a nurse I still think of that pristine white uniform and hat. Personally, I liked the white because you knew who was who. Now you have to look at name tags because the entire hospital staff is in scrubs. Some images though we can never shake and regardless of scrubs, that reassuring white uniform will always spring to mind when we think of a nurse. Thank you for writing this. 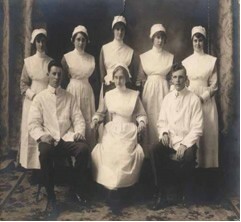 I am a nurse and I agree the the traditional white uniform and cap denoted a nurse. I also understand from my own personal practice that this traditional uniform is difficult to maintain, however, that being said, I still was able to find a nurses cap that was specific to my nursing college (University of Detroit Mercy, formally known as Mercy College of Detroit) and I always proudly wear my nursing pin. Now, if I could only find an original 1940's Mercy College uniform (complete with cape) and a Mercy College nursing pin from the same time. Thank you for taking the time out to read this Sel :) It was quite interesting to research and is my most read blog to date. Good luck in your quest for a uniform complete with cape! Wonderful piece of information. I feel that uniforms of healthcare professional must be very comfortable. My sister is running a hospital and she was looking for someone who could design comfortable scrubs for her team. After much research she chose http://infxousscrubs.com/. These people took elements of everyday styles and incorporated them to fit my sister’s needs. They truly worked wonders. Great to know about cheap nursing uniforms. Well dear these days there are varities of scrub tops available online and I always buy according to my preferences. My sister is working in children ward and she likes to wear cheerful medical scrubs. I found this post late but it is very impressive post of unifrorm .Thank you for sharing. Simply put, I live in the past. I love everything about yesteryear from clothing to movies to houses. I'm particularly mad about history and vintage fashion so it's little wonder I became a seller. This blog is intended to highlight key moments in fashion history and the men & women who changed how we dress as well as offer my personal observations of the online selling world. I operate Falls Avenue Vintage Fashion on Ruby Lane and offer a wide selection of men's and women's vintage clothing and fashion accessories, linens and jewelry from the Victorian period to the 1980s. Falls Avenue is in it's fourth successful year with stock arriving weekly. Everything you need to know about vintage fashion.